The Natural Resources Branch has stocked Otter Creek with rainbow trout on 11 April. The section of the stream from the Pump House to Camp Carlson has been stocked. An additional stocking will occur later in April. A Ky fishing license and trout permit as well as a Ft Knox fishing permit is required. The KDFWR is stocking catfish at Carlson Lake on the Monday 15 April. Carlson Lake is a FINS(Fishing in the Neighborhoods) lake. A Kentucky fishing License is required and that is the only body of water on Ft Knox where a Ft Knox fishing permit is NOT required. ​ PROOF OF FIREARMS REGISTRATION RESULTING IN A WEAPON PERMIT SHOWING DATES VALID TO AND FROM MUST BE PROVIDED TO THE HUNT CONTROL OFFICE AND ACCOUNT VALIDATED PRIOR TO PURCHASE OF A PERMIT UTILIZING A FIREARM. PROOF CAN BE EMAILED, OR IN PERSON More information on how to get this done can be found below starting with the yellow text. 2019/20 Small Game, Fishing, Combo Sm Game/Fishing and Spring Turkey permits are now available. Fishing and Small Game permits are valid 1 March 2019 thru 29 Feb 2020. Please pay CLOSE attention in acquire permits tab of your account to ensure that you are purchasing the correct permit. 2019/20 Deer and Fall Turkey permits will be available in August. All permit purchases are required to be done thru your account using credit or debit card. Cash and Check are no longer accepted. The Hunt Control Office will be glad to assist customers complete the transaction if assistance is needed. 2. Scan Weapon Permit and email to the above email address. 3. Bring Weapon Permit to the Hunt Control Office during normal business hours shown at the bottom of this page and we will update your account. Once the Weapon Permit is received your account will be updated with the required firearms validation that will allow purchase of hunting permits thru the valid date on the firearms registration. Fishermen do not need a firearms validation. ​Game harvest must be reported in iSportsman when checking out of your Hunting Area. ALSO, you must use the KDFWR's Telecheck System to check-in your Fort Knox deer, turkey and bobcat. Select either Hardin, Meade, or Bullitt County (not a problem if not sure, just select Hardin), then public land, then Fort Knox Military Reservation. IT IS IMPERATIVE THAT ALL PERSONS THAT CHECK IN THRU ISPORTSMAN CHECK OUT OF THEIR AREA BY THE TIME REQUIRED. 15 DAYS SUSPENSION FOR FIRST OFFENSE AND 30 DAYS FOR SECOND WILL BE ENFORCED AND IS NOT APPEALABLE. 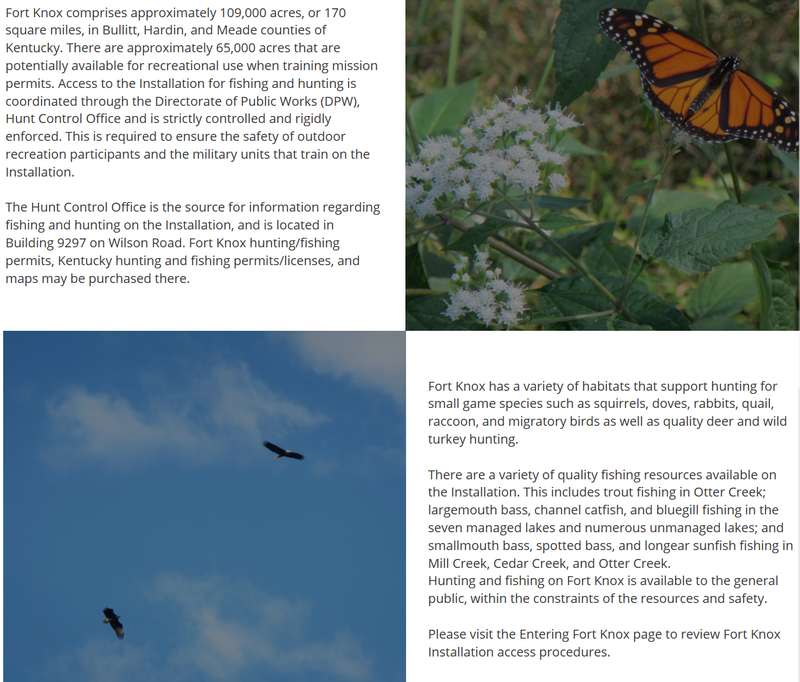 ​2018 Hunting and Fishing information is available at the "Guidelines" button on the blue bar above. (FK Form 2759) TO THE BELOW HUNT CONTROL OFFICE EMAIL! Click here Firearms Registration Information, for the correct application procedures. Only valid Weapons permits received from Provost Marshals Office, Fort Knox, Ky at the Chaffee Gate Visitor Center (with dates valid) should be sent to us for account validation. ​Click here to purchase Kentucky Department of Fish and Wildlife Resources Hunting and Fishing Licenses, Permits, Merchandise, and Elk Lottery Permits.